I have many homemade spaghetti recipes from scratch that you will love. These are spaghetti sauce recipes. These recipes from Italy are authentic, easy to prepare and simply delicious. Heat oil in a heavy 8" skillet over medium heat. Add the oil, onion and garlic. Saute, stirring often until the onion is transparent. Add the clams, clam juice, parsley, black pepper and oregano. Bring to a boil and reduce heat. Simmer, uncovered, for 30 minutes. Meanwhile, cook the pasta according to the package directions. Drain and place on a warmed plate. 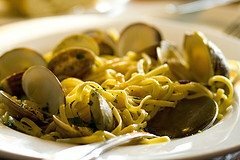 Sprinkle with Romano cheese and top with the clam sauce. This is a delightful spaghetti recipe that is easy to make and tastes like you spent all day making it. Heat the oil in a heavy 10 or 12 inch skillet over medium heat. Add the onion, garlic, oregano, basil, parsley, shrimp and crab meat. Saute and stir for 5 minutes. Squeeze the tomatoes with your hand into a saucepan and cook, uncovered, over medium heat for 30 minutes. Meanwhile, cook the pasta according to package directions. Drain and place on a warmed platter. Serve with the sauce on top. If you are a shrimp lover, this spaghetti recipe is a "must make" recipe. Meanwhile, heat the oil in a heavy skillet over medium-high heat. Add the onions, garlic, parsley, salt, pepper and oregano. Saute, stirring often, until onions are transparent. Add the shrimp and cook, stirring occasionally, for 5 minutes or until the shrimp turn pink. When the pasta is done, drain and place on a deep bowl. Toss with shrimp mixture and serve. Fresh and delicious, this spaghetti recipe features ricotta, arugula and Italian sausage. Meanwhile, combine the ricotta cheese with the Parmesan cheese, egg, salt, pepper, oregano and garlic powder. Add more seasoning according to taste. Drain the pasta and leave a little water in the pot. Add butter to the pot and place the pasta back in, tossing well. Stir in the ricotta cheese mixture and place in a baking dish. Top with mozzarella and put under the broiler until the cheese is melted but not browned. Serve with cooked Italian sausage. 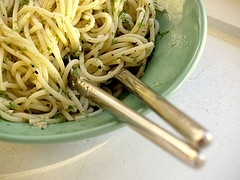 This spaghetti recipe is so simple to put together and I love the fresh taste. Heat oil in a heavy 8 inch skillet until it is very hot, but not smoking. Add the garlic and saute until lightly browned but not burned. Discard the garlic. Add the basil, salt, pepper and bread crumbs; stir to mix well. Turn heat down to low and brown the crumbs for several minutes. Cook the pasta according to package directions. Drain and place on a warmed large platter. Pour the oil mixture over the pasta, gently tossing to coat evenly. Sprinkle with the grated cheese and serve.